Back from a 2-night stay in the beautiful market town of Clitheroe in the Ribble Valley, Lancashire. It nestles between Pendle Hill (famous for its witches) and Waddington Fell. In my totally unbiased opinion this is the most beautiful town in the world … although I was born there and only moved away in 2012! We stayed at the Edisford Caravan site down by Edisford Bridge through which the River Ribble flows. The site was clean, almost full yet quite quiet, and sloping in areas but we got a flat grass pitch (No.30) so no chocks required. No choosing your own pitch though, the warden instructed us where to pitch up. The site has a miniature steam railway and a 9-hole pitch n putt course but availability depends on whether or not the ice cream van is parked up(!) because that’s where you hire your clubs and balls, and he visits intermittently throughout the day. Failing that, there is a swimming pool, gym and tennis courts across the main road at the top of the site. Also, there are nice walks along the river bank or a steady 2 mile walk to the nearby village of Waddington. We cycled there and sampled a few bevvies at The Lower Buck Inn & The Waddington Arms. It’s a pretty village well worth a visit. 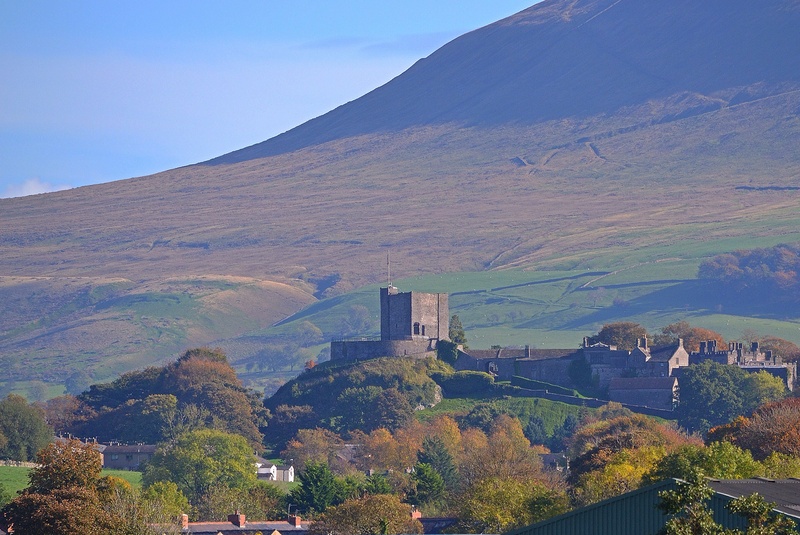 Clitheroe town centre is about a 25 minute walk from the campsite, and places of interest would include the Norman castle keep & museum, town centre shops particularly the award-winning Victorian Byrnes Wine Shop, Cowman’s Famous Sausage Shop, coffee shops, wine bars, gift shops and designer clothing shops. For us though, this weekend was about catching up with family and involved plenty of food and drink. On Saturday night we took a taxi into the town centre for a meal with sister, brother-in-law, niece & nephew at La Vespa, an authentic family run Italian Restaurant. Good food and service. On Sunday afternoon we had four generations of my family drop in on us to have a look around Jolly. Surprisingly, at one point all ten of us were inside Jolly, proving how spacious he is! We then headed out to the Edisford Bridge Pub just a 5-10 minute walk from the campsite, for a late Sunday lunch. Good pub grub. Afterwards, the two of us just chilled out and played cards for the remainder of the day then cabined up as the rain set in. We will return again and again to Clitheroe because of the personal connection, and Edisford Bridge Campsite is a perfectly good place to stay. Great weekend! Next stop Englethwaite, Cumbria next weekend. Can’t wait.